One of the things I love about visiting New York City is all the wonderful architecture. Everywhere you look you can find buildings with interesting shapes and details. 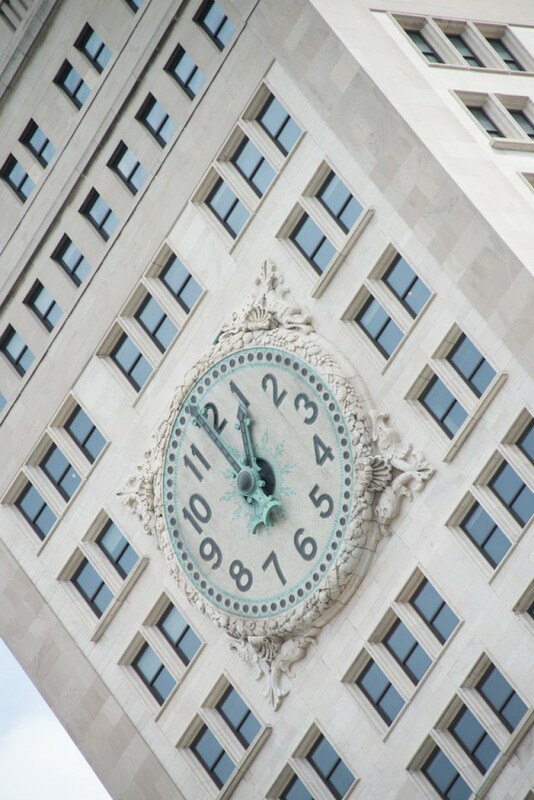 This image shows the clock face from the Metropolitan Life Insurance Building. You can see from the picture the great detail work put in to creating this clock, details which most people would never see from the street. I especially like the detail work done with the tiles of the clock face. Producing this image was somewhat interesting. A couple of days ago I posted an alternative version of this image to my New York album. As you can see below, the raw camera shot shows a lot more of the building. 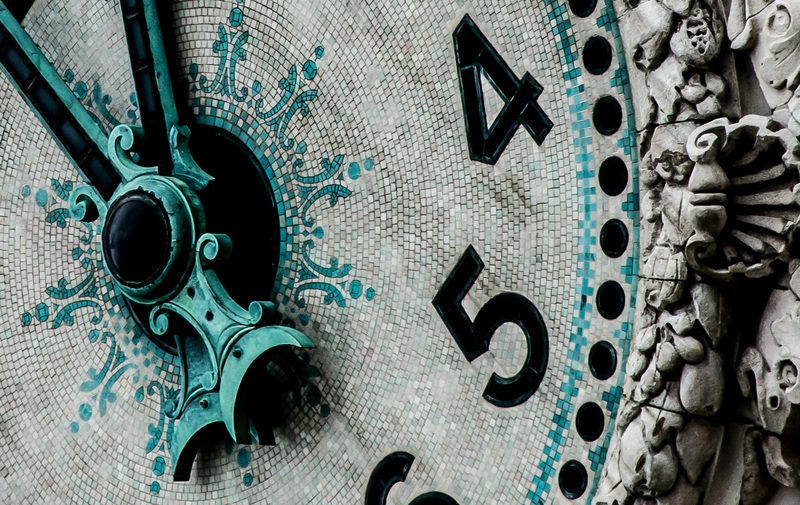 The image I posted to G+ cropped things down to showing mostly the clock. I got a question from a viewer asking me about the green color and whether it was copper or something else. I went back to Lightroom and zoomed in to see if I could find out more. When I did, I was surprised at the level of detail found at that level of magnification. (click the image above to view larger) I could see the texture of the individual tiles. I used a rented D800 combined with my 28-300mm lens to take the shot and I’m certainly happy with the details that the 36 megapixels could capture. I decided right then that I wanted to create an image out of this tight crop which is the image you see above. I am surprised Nikon has not contacted you to use these two images in an advertising campaign for the D800. The 36mp really allows for an amazing magnification. So, when do you get your own D800, James? That resolution is fantastic. And I’ve read mixed reviews on that lens but yours looks really great. May just pick one up to replace a few of my carry around lenses. I don’t currently have a D800 on order, when it was first announced I didn’t think I really wanted a 36 megapixel camera. However, after using it for a few days, I might just have to change my mind. The 28-300mm lens is a mixed blessing, at least my copy of the lens. On the plus side it covers a wonderful range of focal lengths which works great when you are walking around. As I walked around New York I was able to quickly go from pretty wide to tele in short order. The downside is the quality of the image. I think in the center it tends to be pretty good, but it tends to vignette around the edges. The automatic adjustment for this lens in Lightroom does a pretty good job correcting it, however. oh wow man, that’s a cool shot. Wow, very beautiful shot. Love that you saw this image within the frame. Great going!